You can easily combine the two to make a capable deck. Keep going for the other deck archetypes. What this idea does is provide a mini-game for more experienced players and variety of gameplay, while less experienced ones get a view of deckbuilding and a form of "smash-up" that is more fun than simply picking up a ready deck. If you want to really spice it up, add some loose cards players can switch in between games - a sort of a sideboard. For example, with 10 30-card decks, you have 90 combinations. eyes2sky: actually I just came up with a better idea. Renegade Freighter. I'm really missing Land Grant in this; especially with Lead the Stampede present, you really want every bit of land-thinning you can get. Also, I'm thinking Renegade Freighters would make more effiecient colorless tramplers than the Devastator. 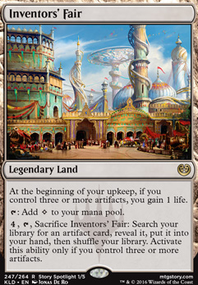 As for the sideboard, Naturalize is a pretty lame choice. Go for Gleeful Sabotage instead, or Sundering Growth, if you want to stay at instant-speed. Tangle seems like a worse choice than Moment's Peace; two consecutive turns of no attacks is not as good as any two turns. And Spidersilk Armor is probably a better fit for flyer-hate than Vines & Scattershot, because it also softens enemy boardwipes like Shrivel, Electrickery or Holy Light. Also, there should you should hand 1 sideboard slot to Flaring Pain as a little surprise for tome/fog builds. 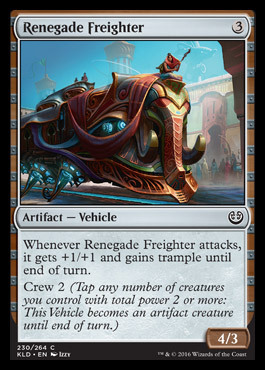 What do you think about Untethered Express over Renegade Freighter? AliMoe on Going for a Jhoi Ride! NoSoyYucateco no it isn't, sine Jhoira's ability triggers on "casting" a historic spell, not an historic card "entering the battlefield". 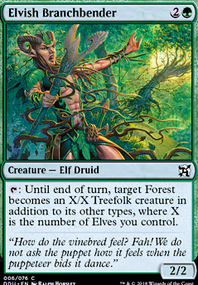 There are a few good cards it interacts with though, like Reckless Fireweaver, but imo it's not worth running it if your deck is not built around it. HARDsofty This is a nice idea for a deck, I like the vehicle theme. There are a few tweaks I would make without changing the theme of the deck: I think you could run less than 38 lands. The amount of cards you draw with Jhoira should guarantee you a land drop every turn. Also, I would consider cutting Mind's Eye, since you want to spend your mana during your turn, and drawing cards that way. 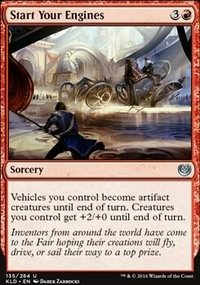 Also, I would include Thopter Engineer, since giving all your vehicles haste is insane ;-) I would cut Ghirapur Gearcrafter for it. I would also consider cutting both Implement of Combustion and Implement of Examination. They are either expensive, or basically don't do anything. If you are playing them for the card draw, consider instead playing spell bombs, or Chromatic Star/Sphere, since they also offer you utility/fixing/draw. As for the vehicles, is there a reason you are not playing Aethersphere Harvester, Heart of Kiran, Skysovereign, Consul Flagship or even Cultivator's Caravan? They are a lot stronger than Irontread Crusher, Ovalchase Dragster, Sky Skiff and Renegade Freighter. I made Jhoira deck as well. It has a lot more smaller artifacts and is buid around casting a lot of cheap efficient stuff, which is clearly not your strategy ;-) but if you want some inspiration, take a look at it.